ACTION Blog: Wilson, Williams, and West: A Crisis of Respect? 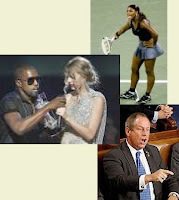 Within a week, we have seen three very public instances of disrespect in the arenas of state, sport, and stage. In school terms, these incidents would cover nearly the full spectrum of co-curricular activities: student government, athletics, and performing arts. Last Tuesday, during President Obama's address to a joint session of congress, Representative Joe Wilson shouted out "You lie!" in response to the president's insistence that his health care plan would not cover illegal immigrants. On Saturday night, tennis superstar Serena Williams berated a line judge for what she considered a bad foot-fault call. The outburst earned Ms. Williams her second reprimand of the night and because it was match point, Ms. Williams lost the contest as a consequence. On Sunday night, at the MTV Video Music Awards, rapper Kanye West took the microphone out of winner Taylor Swift's hand during her acceptance speech in order to say, essentially, that another nominee, Beyonce´, was more deserving of the award. In a school, the representative would have been kicked out of class, the rapper would have received detention, and the ranked athlete would have been suspended. Tuesday I quoted a statistic from the My Voice Survey that only 30% of students agree that students respect one another. In the same survey, 39% agreed that students respect teachers and 54% agreed that teachers respect them. For years these numbers have caused me to wonder if there is a crisis of respect in our schools. Perhaps the crisis is more widespread.